Karen Blair is an American artist living and working on a small farm at the foot of The Blue Ridge Mountains near Charlottesville, Virginia. 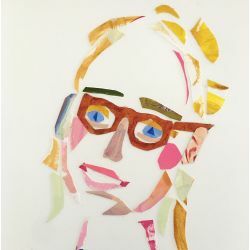 She holds a Bachelor of Fine Arts Degree from The University of North Carolina, Greensboro and has been the recipient of fellowships from The Vermont Studio Center and The Virginia Center for The Creative Arts. Her work is in private and public collections throughout The United States including Dominion Resources, Markel Corporation, Philip Morris, USA, The University of Virginia Hospital, The University of Iowa, The Couric Clinical Cancer Center, Charlottesville, VA and The Levine Cancer Center, Charlotte, NC.